Hi there! Been so busy with life that I once again had to STOP and evaluate my Self Care Activities. After spending time with the Lord I also found 22 Awesome Scriptures to Know for Practicing Self Care. I also decided to write 40 Easy Self Care Ideas for Busy Tired Moms as a reminder for myself and other Moms that may need them too. I hope you will try at least some of these! Of course these are just a jumping off point! You may want to include many of your own daily routines. 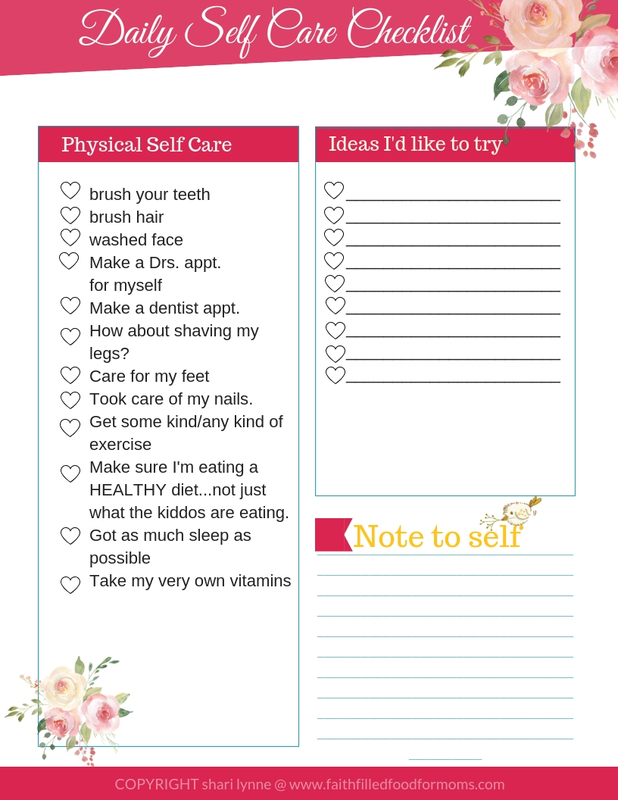 I’ve included a free daily routine printable self care checklist, so don’t forget to grab it at the end! As a Mom of over 40 years, it took me a long time to figure out that I needed to stop giving every last drop of myself to my family, friends, acquaintances and work. Self Care is NOT selfish my sweet Mama friend! It took me so long because I had a wrong perspective of just what self care was or the benefits of self care and healthy living was for us Moms. You too may be wondering what are some examples of self care you can easily implement into your days. I hope by the end of this post you will be confirmed in your desire to make time for yourself and self care. 9 Another Idea for you, How to Create a Self Care Basket! We all have a certain amount of hours a day to fit in the most important essentials. Whether we are working Moms or SAHM, we are busy and we get tired AND there never seems to be time for ourselves. Unfortunately, I’ve learned the hard way that this can lead to physical breakdown, emotional turmoil and spiritual emptiness ie. not a very happy mama! Since self care is different for everyone, just as every single woman is different, I’m going to break it all down to what has worked for me and the different areas that have helped me the most. I pray that you can use these very important tips to help you to create your own tailor made self care plan. My prayer is that you will be able to improve your self care and pass it on to the next generation. We can’t pass on what we don’t practice! Self Care is NOT selfish even if you are a Christian. Yes if we become to obsessed with ourselves to the exclusion of others, then it can become sinful. However in it’s essence, it is not a bit selfish. I would argue it is healthy survival. It should NOT add stress but begin to relieve your stress and contribute to your happiness and ability to serve others as you practice Self Care. Just what IS Self Care? Self Care is actually a term that used to be used in the medical community for someone that is capable of say, going home from the hospital and being able to “self care” without assistance. The term these days is used for more of a pampering type of title. The truth is however, without some of these pamperings, boundaries and caring needs of ourselves…we COULD end up IN a hospital! 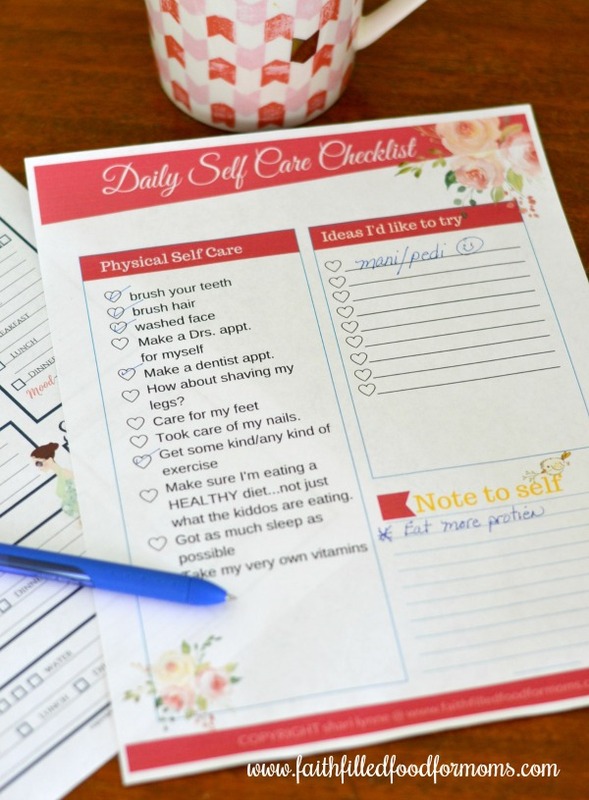 There is a free daily routine self care checklist printable at the end of this post…don’t forget to print it out! These are the simple breakdowns of the areas that have helped me the most in my Self Care journey and have helped me to be a much happier mom, wife and employee. This seems ridiculously simple to some, but not so much to others…me included for years. The end of the day comes and you realize you have not even brushed your teeth, hair or even washed your face. You have not made a Drs. appt. for yourself in yeeears! Nope not a dentist appt. either. How about shaving your legs? Taking care of your nails? Nope they don’t have to be fancy! Made sure you were eating a HEALTHY diet…not just what the kiddos are eating. Take your very own vitamins? I created a DIY Self Care Basket for Pampering myself! If you are a Pregnant Mama, here is a Free Printable Checklist for you Also! Are you making time to spend alone with God? Trust me, I know it’s hard! The benefits of sitting at the feet of Jesus though, far out weigh the little time it takes to connect and hear from Him. Since I started back to work a few years ago, I’ve been tired and been spending alot of time just learning how to work outside the home again after so many years. I see my friends occasionally but I had gotten out of the practice of actually meeting up with friends face to face and having heart to heart talks. This last year I worked hard at my friendships and it has definitely helped my social self care! I’m a happier Mom for sure! Join a club or committee that will ENHANCE your self care. If it’s too much…drop it! Do something nice in your neighborhood ie bake cookies take to fire department etc. Only say “yes” to social activities that will not put you over the edge. I have literally spent years and years trying to practice emotional self care. Being a person in recovery, this has come strongly along side my Spiritual Self Care journey. Since this is a very personal journey and different for everyone, I can only share the areas that have helped ME tremendously to have peace and joy. I’m not a “certified counselor” so these are strictly areas that I have had to work on over the years. I was chronically unorganized for years. I have to say I felt SO good when I read a book called The Messies Manual! This is an OLD BOOK but is still being sold because its so good! It really helped me to know I was not alone and it helped me tremendously in getting organized. Another resource I highly recommend is The Homemaking Super Bundle! Although we manage our money fairly well, I still never feel quite at ease about our finances. Financial chaos can wreak havoc on our health. It can cause all kinds of stress. This is why I put it under the Self Care category. 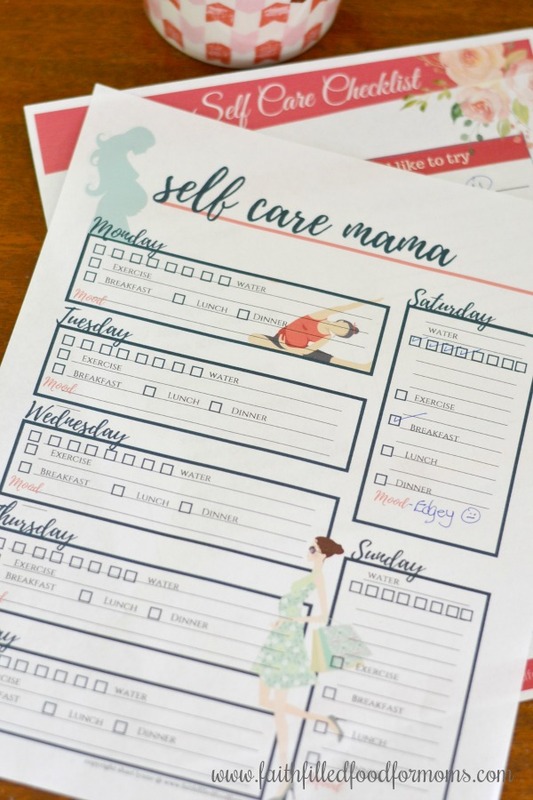 I created this free printable Daily Self Care Checklist for you to remember all the things to be good to yourself, love yourself and so you would know that you are not alone in this mom journey. Another Idea for you, How to Create a Self Care Basket!